Linda and David Pain, observing a masters meet as honored guests, made everything possible for us. He was THE giant. I’ll share my own memories later. For now, please see my obituary of David Pain on Times of San Diego. It’s impossible to overstate what David meant to me, the sport and the world. Please join me in wishing deepest condolences to Linda Pain and their extended family. 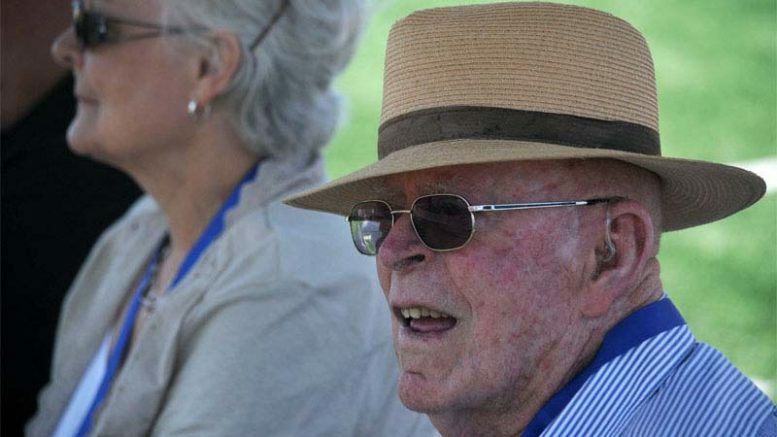 Meanwhile, here are some touching remembrances from his 90th birthday party and 2014 salute by the San Diego Track Club. Ken has followed track as an athlete, writer and webmaster since the late 1960s, and saw most sessions of track and field at the 1984 Los Angeles and 1996 Atlanta Olympics. He also attended the 1988, 1992, 2000, 2004, 2008 and 2012 Trials. He worked for 10 newspapers and now reports for Times of San Diego. Write him at TrackCEO@aol.com or kens@timesofandiego.com. Story tips always welcome! 9 Comments on "Our founding father has passed: David Pain dies at 96 at home in San Diego"
Rest In Peace David. Thoughts and prayers to his family. I did not know the man personally, however he had a very personal impact on my health and overall well-being. His efforts in starting Masters T&F provided me the opportunity to enjoy a sport and a lifestyle that has greatly enhanced my life. His legacy is undeniable. Ken, when I read about Dave’s passing this morning, I truly thought of you first and our conversation, a while ago. You have been visiting him regularly and even brought a favorite snack (can’t remember what it was?) My question was , does Dave recognize you,? hopefully. I imagine, you have that fond memory amongst others. Yes, it all started with Dave and not too many of our younger athletes have met him. Waiting for your memories to share. I have my own, and at our last conversation that Dave and I had,before the party you gave him, we parted with hugs and nothig but good wishes. That is my best memory. I did not know David but yes my life is changed by Masters Sports, I am grateful to him and I very much look forward to the recounts of who he was as a person. Sad news. I send my condolence to his family. I had the pleasure of meeting and working with him on the then World Association of Veteran Athletes, I much admired his enthusiasm, flair and sense of fair play. He instigated international competition for Masters. The first Club solely for men aged over 40 was formed in London in 1931, the Veterans Athletic Club, and is still flourishing today. Thank you, David, you were an inspiration. Rest in Peace. Nicely said, Bridget. I believe I met David Pain only once, and our encounter was very brief, but I realized that I was in the company of a man who had had a big impact on me and countless other men and women. Yes, I entered masters T&F in late 1976 at age 31, and right away I knew that I had become involved in something special. Today, I am still active in masters meets, and I thank David Pain once again for what he did for us. Condolences to David’s family and friends. I am so sorry to learn of Davids’s passing, please convey my condolences to the family. David was full of energy, crerativity and persistance. The Masters program would not be where it is today were it not for his early efforts tp promote Masters programs. I was hooked on Masters after enjoying several tours he and Helen put together, primarily to Hawaii. The 1989 WMA Championships in Eugene were in large due to his persistance. We owe himn a greal deal of gratitude and he will be missed! Provided by David to us now free of charge … a history of some the beginning athletes and beginning meets. Thank you again David. Watch 'Secrets of Growing Old' on ITV1 at 9 pm this evening (1 June) to see masters athletes in action. Congratulations to GB masters in World Indoor Athletics - 1st for Dave Wilcox, 3rd for Karen Brooks. Shunned by the BBC - shame on them! IAAF world championship in Beijing hosted 2 exhibition races for world class masters athletes. Ignored by @BBCSport ??? Wish to challenge the BMAF Executive on their plans for the future? BMAF AGM is in Alexander Stadium Birmingham 6:30-8:00 pm this evening. Andy was a giant in the coaching world and his greatest accomplishment was the positive impact he left on those he coached. Check out these articles. Something for all track and field athletes. Lots of OMA members will be running in Boston on Monday and will be looking for this beautiful blue and yellow line. Finish line has been installed on Boylston Street! 10000m championships for masters and open in #LdnOnt May 10. Last year we had three intrepid masters. Who will step up this year for the 25 laps? What do you think about doping in sports? Join the global conversation on April 10 by using #PlayTrueDay. Together we can make a difference. Looks like an M40 world indoor record for Southwest Masters.